Seminole Hard Rock Hotel & Casino Tampa is celebrating 10 years of being one of the biggest economic drivers for the Tampa Bay region on March 11th. “We want to use our 10th anniversary as a celebration of the property’s successes and accomplishments,” said Seminole Hard Rock Hotel & Casino Tampa’s President John Fontana. 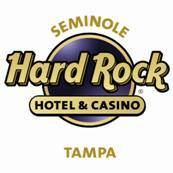 According to the Tampa Bay Business Journal (July 5, 2013 issue), Seminole Hard Rock Hotel & Casino Tampa was noted as the fifth largest private employer in 2013. The property currently employs over 3,300 employees. It is estimated that over the next 10 years, Seminole Hard Rock Hotel & Casino Tampa will make a $6 billion economic impact in the Tampa Bay community. This includes payroll as well as direct and indirect spending. In addition to its economic contribution, Seminole Hard Rock Hotel & Casino Tampa has made a significant impact on the community through corporate philanthropy over the last 10 years. Through its in-kind and cash donations, as well as sponsorship and retail efforts, the property has donated well over $5 million to the Tampa community by working with over 100 charities, including an annual commitment to fund the Florida Council on Compulsive Gambling. Additionally, for each of the past three years, six Hillsborough County cultural institutions (Florida Aquarium, Lowry Park Zoo, Museum of Science & Industry, Straz Center, Glazer Children’s Museum and Tampa Bay History Center) have shared about $2 million in Seminole Tribe gaming funds. This year, in appreciation for the Tampa Bay community’s support, Seminole Hard Rock Hotel & Casino Tampa will be giving away $100,000 to four designated charities in honor of the 10th Anniversary. The money will be distributed in increments of $10,000 a year for 10 years. The charities are the Bill Edwards Foundation for the Arts (http://www.themahaffey.com), DeBartolo Family Foundation (http://www.debartolofamilyfoundation.com), Metropolitan Ministries (http://www.metromin.org) and Hands Across the Bay (http://www.handsacrossthebay.org). Over the past 10 years, Seminole Hard Rock Hotel & Casino Tampa has made many significant changes, both economically and internally on the local community. The Seminole Tribe of Florida casino and resort operations as well as Tribal government employment indirectly create jobs, earnings and spending throughout the statewide economy. From increased employment to revamped luxury amenities to the casino, hotel and restaurants, Seminole Hard Rock has created a high-end scene for guests to celebrate 10 more rocking years. Guests are encouraged to tag their photos on social media with #HardRock10 and #HardRockTampa to be entered into numerous contests throughout the month. Throughout the month, guests will also be able to take photos in front of a customized anniversary banner displayed in the casino lobby bar. The property will have a photographer on site on Fridays and Saturdays (7 p.m. to 11 p.m.) to take shots of guests having fun. For 10 days (from March 2 to March 11), the property also gave away $10,000 to 10 different employees.